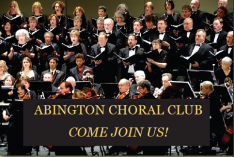 Abington Choral Club is looking forward to an exciting 72nd Season! Auditions for our holiday concert will be held the first two weeks in September. If you’d like to sing with us, click here for audition information.